It struck me the other day that Google Earth would be good platform for sharing my data with other people and found out that lots of people display their own data on the platform. Google even has a website to distribute Google Earth files that they like (this one, of the world population, was one of my favorites). So then I looked around to see if anyone had written code to help people convert Matlab data into Google Earth files. The Google Earth Toolbox (recommended by my colleague Amir) worked great. 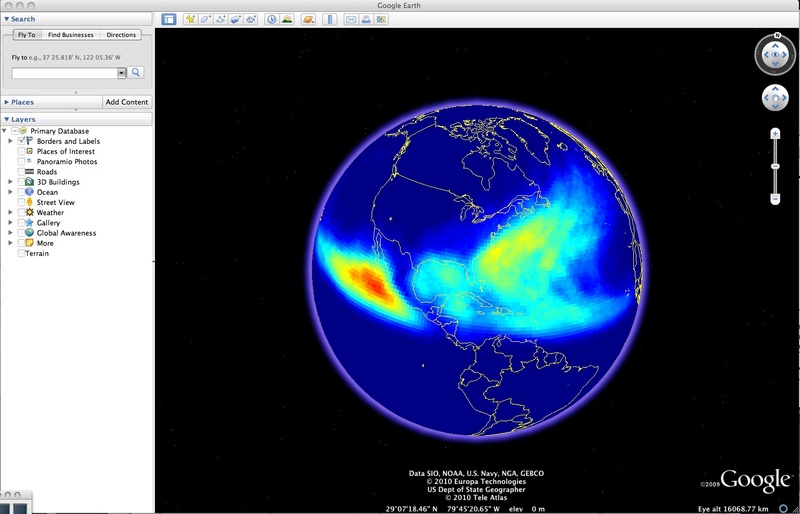 It allows you to display data using functions very similar to standard Matlab functions (eg. imagesc()) only the output image is projected onto the planet and can be explored using Google Earth. 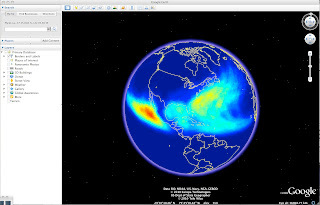 The image above is a map of the tropical cyclone climatology that I imported to Google Earth with only two lines of code. It seems to me that one huge advantage of this presentation method is that pretty much anybody can view and explore global data-sets, since the interface is entirely intuitive and requires no manipulation (similar, in many respects to the contribution of Gapminder). Below the fold is the script I used to make a Google Earth data set that changes over time. Making the movie above required two additional steps. Add a "Tour" in Google Earth (under "Add") which just records your browsing of your data in a movie that plays back in the Google Earth Application. Use a screen capture program to record that movie as it plays back. (My friend Pam recommended this screen capture software, which works nicely and is easy to use). UPDATE: SINCE I'VE REPEATED THIS PROCESS A FEW TIMES NOW, I'VE WRITTEN A FUNCTION IN MATLAB THAT GENERATES THE GOOGLE EARTH FILE. ITS SIMILAR TO THE SCRIPT BELOW, BUT IS EASIER TO USE FOR AN ARBITRARY DATASET. DOWNLOAD IT HERE. %I think if you change the file name to be ".kmz" it will zip it into one file for you. I just ran this and saved it from google earth into a .kmz file. could you post you DATA.mat file so I can try to adapt this to my prefrences? DATA - M x N x T array of data, where each M x N layer describes data that occurs simultaneously at a moment in time. The third index is the index for the time variable (years). in both files, you also need to specify the strings FILENAME and LAYER_NAME (VARIABLE_NAME in the function). The former is the name of the file it writes out, the latter is the name of the layer that will show up in google earth. I am trying to do something very similar but with precipitation data, however when I do the animation the stars in google earth also move with the time span slider and it is quite dizzying so I was wondering how you removed the stars from your movie?